Monday. I write that here to remember it. Monday, Wednesday, 7, 23, April, December? It’s become irrelevant in some ways. In other ways one needs to know what day of the week it is, should one need a book or a quick run through the thrift store, both closed Mondays and Sundays. The library however has a strong enough wifi signal to mooch from and they kindly provide comfortable benches right outside their doors. Notable times here are becoming so not by times or dates but by quality of light. Early mornings and dusk when our long shadows follow, lead or walk beside us, up and down trails, roads and washes. I love the desert more and more. The terrain is otherworldly and can be tricky. You think you can see far into the distance but it dips and rises making things disappear and reappear like magic. 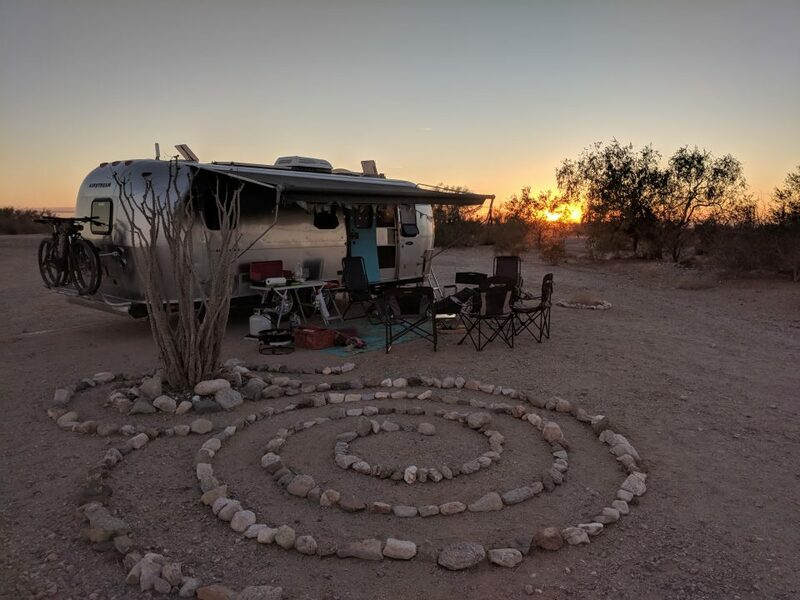 We’ve come upon seemingly abandoned encampments cobbled together from hay bales, furniture, wood, old phone booths and tarps and rock gardens out where you can’t imagine anyone working that hard. The only life, other than the occasional human variety we’ve seen are rabbits, birds and dragonflies. A hummingbird visits at least once a day, peeks in the open door, flits around camp for a minute and takes off until the next day while the dragonfly perches on the tip of the van antennae. At night the coyotes yip and howl late into the night. Meanwhile our little nest/spacepod is becoming an efficient and cozy little hang about. We organize a little more each day as we learn our new way of life. It gave me great pleasure to organize the kitchen pantry and bathroom cabinet today. I marvel at how little we need and how well this little Lairstream suits us. The van is finally clear of all the stuff we needed with us but didn’t quite know what to do with. There is a place for everything and there has to be, it’s a tiny space and we both like keeping it neat and tidy. You have done it, you have done it, you have done it, you are doing it, I am amazed and awed but not surprised. Love from Florida. And big hugs. I can barely imagine the life you now lead, but I have such a fine time trying. Congratulations! 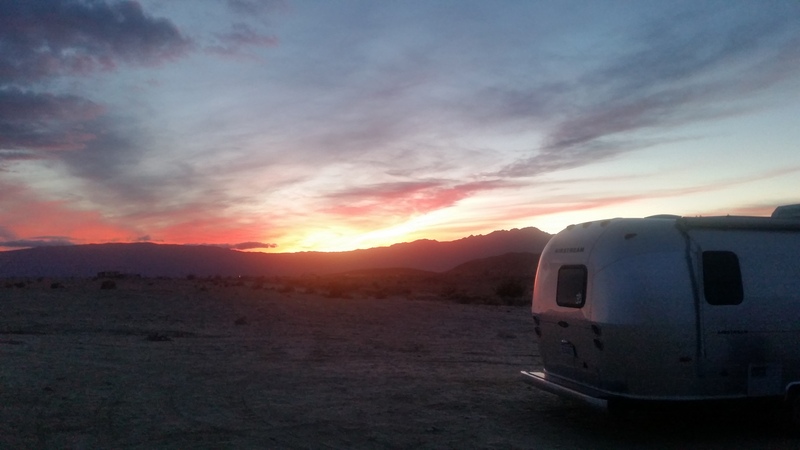 Anza Borrego was one of the places we’d planned to visit this winter, but then the spousal unit pulled up lame. Hopefully we’ll go in the new year before it gets too hot. Allison, I think you’ll love it here. I know about surprises and how things can change in a moment! Hope he is a speedy mender. Welcome N2. So happy you’ve joined me. I love that photo of the end of the Airstream. I, like Angella, am in awe of what ya’ll are doing and can’t quite imagine it. Thank you for sending us this little postcards, though. It’s like a dream journal!